Are You Playing It Safe With Your Finacnial Future? 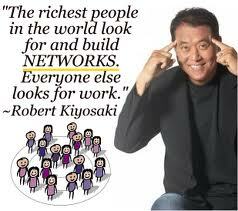 Robert Kiyosaki Says YES! In this economic climate is it wise to make risky decisions about your financial future? Seems like a funny question given that unemployment rates are rising and economic recovery efforts have not been effective. Economist are saying that more Americans are saving their money. And with the Baby Boomer Generation starting to get Medicare & Social Security Benefits the purse strings are even tighter. For most of our lives we are told that life has a simple formula of just getting a good education, getting a good job, living in a comfortable home, and saving enough to retire with. In the year 2010 that formula is thrown out the window. Good education cost a arm and a leg. Now that jobs market is in the toilet people are just settling for any job that will pay the bills. Families have been torn apart due to foreclosure. Retirement seems further and further away. But even with all the economic down fall in the past few years people still believe in the traditional American way of making a living. Working night and day for a boss that does not care about your livelihood. Most believe that the economy will turn around any day now and the government will step in and help them. Well this could not be further from the truth. No one is going to give you a hand out nor do you need one. You have everything in your possession to be the conqueror of your finances. At the end of the day it boils down to how to make enough money to spend on what you feel is of value. Because we give value to money. Its just a tool used to get what we want. So the question lies in what kind of financial future do you want. Do you want one of poverty or prosperity? Working for someone else will not get you there. Using the stock market to place bets on 401K and IRA will not get you there either. According to Robert Kiyosaki you are playing a risky and dangerous game. There is no such thing as job security when you are working for someone else. You must take matters into your own hands. How you do that is the simple part. Become your own boss today. Start a business selling products that you love or have an interest in through the network marketing business model. Through your sphere of influence and connects you will grow your business that will pay you while you are sleeping. Plus you will leverage the power of the Internet to build your business globally. If you have a job, great. Jobs are good but not a long-term way to build wealth and prosperity. With the network marketing business model you will work full-time on your job and part-time on your fortune. This is one of the best quotes from Jim Rohn. This business model allows you to grow your business part-time without having to make a major shift in your personal life. If you are not working, that’s great too. You now can work full-time on your fortune. You have the time to go out and learn the skills it takes to succeed quickly in this industry. Keep in mind that this is a very simple process but not an easy one. The whole focus on the network marketing industry is connecting with people. Through the right training and mentorship you will be able to build your business successfully. Its all in the timing and now is the best time to build a business that you control. Don’t let doubts, fears and worries paralyze you from building wealth, taking your dream vacation, paying off your debt, and buying your dream home. Its all within your reach but it will not happen by just sitting on the fence of life. Bet on yourself and bet a prosperous future. Listen to Robert Kiyosaki talk about core concept from his best-selling book Rich Dad, Poor Dad. Click Here If You Love Helping People Feel Their Best Inside & Out!